I believe in treating each patient and their families with loyalty, compassion, dedication and as I would want my own family treated. My personal interests include spending time with family and friends, music and dancing. 847.663.8200 847.570.2984 fax Get Directions This location is wheelchair accessible. I DO NOT HAVE A PROBLEM WITH THE DOCTOR. I AM STILL STRUGGLING WITH THE DIAGNOSIS (NOT HERS) AND THE PROPRIETY OF THIS TREATMENT. Dr Paul was kind and thoughtful. we had a great meeting, very helpful. Dr. Paul has always been very professional and courteous. She always is willing to spend time to explain any concerns I have and answers all my questions. Very professional and knowledgeable....and so young! Very nice, patient and knowledgeable! Shes great. They should all be that good. 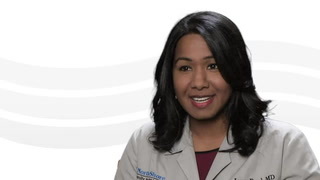 Dr. Jonathan Pomerantz and Dr. Joya Paul explain a new surgery for sleep apnea sufferers.